2 Chambre Log Cabin peut accueillir 4 personnes - Calme cadre privé. Le Hideaway est une cabane en rondins de 2 chambres niché dans les bois près de la rivière AuTrain et seulement 1 1/2 miles du lac Supérieur. Le Hideaway est idéalement situé à proximité des Pictured Rocks Lakeshore, Grand Island, de nombreuses cascades, sentiers de VTT, location de canots et entouré par la forêt nationale Hiawatha. Le Hideaway comprend un salon confortable avec une cheminée à gaz, une télévision Charter / Spectrum, une connexion WIFI, une cuisine complète avec une cuisinière, un réfrigérateur, un four micro-ondes, une cafetière, un grille-pain et les ustensiles de cuisine nécessaires. The Hideaway dispose de 2 chambres et 1 salle de bain avec une baignoire / douche. La chambre principale a un lit king size et la 2ème chambre a 2 lits jumeaux. Les draps et les serviettes de cuisine sont fournis, mais veuillez apporter vos propres serviettes de bain et de plage. The Hideaway dispose également d'une magnifique véranda en face meublé avec une table et des chaises ... un endroit idéal pour se détendre et écouter les oiseaux chanter. Un barbecue à gaz est fourni pour votre cuisine en plein air et il y a un foyer pour les feux de camp en soirée. Il y a des activités d'intérieur qui incluent: films, cartes, puzzles et jeux de société. Activités de plein air comprennent un basket-ball et le basket-ball cerceau, jeu ladderball, et des cannes à pêche. Tentez votre chance charte pêche sur le lac Supérieur ou de la pêche dans le lac AuTrain et la rivière AuTrain. Le Chalet Hideaway Connexion est un endroit idéal pour vos vacances dans les bois du nord. Idéalement situé entre Munising et Marquette. Canoë et kayak de vacances sont à proximité pour une pagaie amusant sur la rivière AuTrain. Poisson ou tout simplement profiter de la douce rivière qui serpente à travers la forêt de Hiawatha. Les bateaux peuvent être loués pour une utilisation sur AuTrain lac. Location de VTT disponibles au Pine Lodge White à Noël. Une belle plage de piscine est situé sur le lac Supérieur, env. 1 1/2 miles au nord de la cabine et il ya aussi une plage publique de natation à la AuTrain Campground, au sud de la cabine. The cabin was great, perfect location outside of munising. Au Train has a little town with a gas station and convenient store located near riding trails. The cabin itself was perfect, plenty of room and amenities. The owners are nothing short of amazing, Karen was a great communicater and so helpful from the first time I reached out until we left. Very nice cabin, very clean, well maintained, and all facilities/utilities worked well. (important in the winter-time). Karen kept in touch to make sure everything was going well..much appreciated! This was out first trip to this region of the UP. We spent Christmas in the cabin and Karen had a lighted, decorated Christmas tree set up for us..very nice. We had a great vacation and we're already planning our next adventure in the area. Nice cabin. Beautiful area. We had a great time. Very nice cabin, clean, & fully equipped. All facilities/utilities worked well. (important in the winter-time). Karen kept in touch to make sure everything was going well..much appreciated! This was out first trip to the region of the UP. Beautiful area..we're already planning our next trip up there. Love the cabin! it was so cozy and has absolutely everything you need. and the owner was so accommodating. The cabin is also located in a beautiful area. Perfect for drives to either Marquette or Munising. I have zero complains about the cabin and if I plan to visit the UP again I would love to stay here again. This cabin is perfect if you're looking for a place to retreat to without feeling TOO isolated. Depending on your preference, it's location directly off a main paved road could be a pro or con; there was some "traffic", but there are enough trees between the cabin and the road where it wasn't a bother. Easy to find. The property - cabin, porch, and grounds - was very clean, and they have it stocked with everything you might need (minus toiletries and towels, which they warn you about when you book). I can't speak on the efficiency of the a/c unit, but the heat was adequate (if you're sensitive to dry air, bring a small humidifier). We only used the room with the king bed, which had just the right amount of space for the two of us. The mattress has seen better days (it sinks a little toward the top), but it was still comfortable enough. The shower pressure was great, and unlike some other places I've stayed in the U.P., we had no issues with the water/sinks/toilet. The only potential downside to this place is the set up of the living room; it wasn't an issue for us, but if you and your family were trying to watch tv or a movie, the couch is perpendicular to the tv with nowhere to really move it. Lake Superior is only a couple minute drive from this cabin with lots of beach front and scenic areas to picnic/walk/swim. There are a lot of waterfalls as well nearby to hike/explore. Even in the surprise snow squall we drove through, it only took 40 min to get to Marquette, and 10-15 to get to Munising. Overall, it is a great central location to be at. The owners were very timely and accommodating as well, which sometimes can be half the battle with trying to find a place to stay. Its a place we'd love to come back to! Property was more than I was expecting. Very well kept clean and appealing. Made me feel like I never left my own house. Owners were very friendly and helpful. Went to enjoy the fall colors and explore the waterfalls and it was nice to come back to a cabin that was warm and inviting. 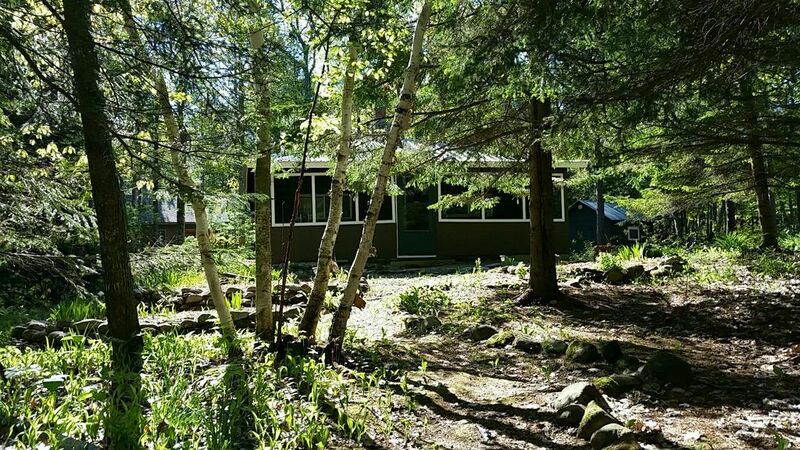 When planning future trips to munising area will definitely book this cabin. Would recommend this place to anybody in a heartbeat. May-October a 3 night minimum is required. Weekly rentals welcome. Please call Karen at 989-430-1548 for any questions. CHECK IN TIME IS 4:00 PM - CHECK OUT TIME IS 10:00 AM Cancellation Policy - If you cancel 30 days prior to your arrival, your deposit will be refunded. If you cancel less than 30 days from your arrival date you will lose your deposit unless I am able to rebook those dates. If I am able to rebook the dates, we will refund your full deposit. No refunds given after check in.